Please help us at the Diabetes Hands Foundation so we can reach out to more people touched by diabetes and continue to raise awareness about diabetes. If you want to contribute money, you can do so by clicking on the “ChipIn” button in the widget at the top right of this blog. 1) Add the TuDiabetes Fundraising widget to your blog or web site, to help us raise funds. 2) Buy TuDiabetes merchandise through the TuDiabetes Online Store. 3) Join the Volunteer Group: through it you can welcome new members and help spread the word about TuDiabetes.com by reaching out to new members or contacting media about the community. 4) At all times, please participate actively in the contests we organize. This helps everyone in the community as our contests are meant for empowerment as well as for raising diabetes awareness. Thanks for your help and, if you have questions on how to donate (online or offline), please check our Fundraising page. The naked people on the cover aside, I had a mixed reaction when I started listening to the “Med Sud I Eyrum Vid Spilum Endalaust” by Sigur Ros. The opening song was just not like your typical Sigur Ros: it was too… pop.. I was confused: was this Death Cab for Cutie? Had I clicked on the wrong MP3 on iTunes? “Gobbledigook” turned out to be a poppier track, indeed, but even at performing pop they rocked! From the second track, you go back into familiar Sigur Ros territory. The main difference (besides the opening track) this time around is that the band gets more intimate, with acoustic guitar-based tracks, such as “Gódan daginn” and “Íllgresi,” and quiet piano-based tracks like “Fljótavík,” the closing “All Alright” and “Ára bátur” (which later evolves into a majestic epic that only they could have recorded). After 8 listens, the album keeps growing on me. There is only one other album that could be as good this year (though it most likely will be in second place: “Maybe They Will Sing for Us Tomorrow by Hammock.” Otherwise, Sigur Ros did it again and make any wait for their music worth every minute. 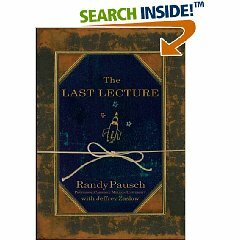 The Last Lecture: a great read! “The Last Lecture” is largely based off the video by the same name that you can catch on YouTube and many other websites. However, that is only part of the story. The book (a few hours to read), unlike the video (under an hour in duration), lets you become one with Randy and his process of preparation for what appears as a certain death as he goes from diagnosis, through treatment and determination to accept his fate of being a pancreatic cancer patient. My dad died of liver cancer, so Randy’s story resonated very strongly with me. However, my dad did not have the chance to prepare himself (or his family) for his passing. Randy has chosen to live the rest of his life on earth preparing things so that his young children will know what his dad was like… this is a father who loves his kids, no doubt. Instead of rolling on the bed or complaining about his fate, he embraces it fully (with humor, often) and gets as much out of him as he can, so that his children will have a vast testimonial from which to learn, even though his father won’t be around.